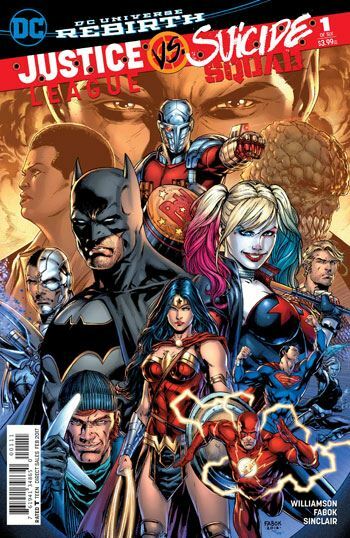 I was more than just pleased to see that the Justice League vs Suicide Squad miniseries was being handled by Joshua Williamson. In the few months since Rebirth began, I have enjoyed his work on Suicide Squad immensely. About as much as I have not enjoyed the stories running in Justice League. Now the one big piece of news about this issue is something I will not spoil. The return of a great character, although more attention ought to be paid to what the person is standing in front of. Another indication of bringing back the reality wiped out by Flashpoint. Probably because it’s their own writer, but the Suicide Squad really dominate this first issue. We get to see the team in battle, while the Justice League spend their time sitting around talking. True, this does allow new readers a better chance to get to know Captain Boomerang, Harley Quinn, Deadshot, Killer Frost, the Enchantress, Killer Croc, and El Diablo, while they probably do not need the same sort of introductions to Superman, Batman, Wonder Woman et al. It also keeps the dialogue on a more spritely level. The Justice League are aware of Task Force X in this story, and none too keen on it. They make the decision to shut it down and take the villains into custody, not appreciating that Amanda Waller would rather detonate the bombs in their heads than let her personal army fall into the hands of the League. So the Suicide Squad are not merely fighting for their freedom against the heroes, they are fighting for their lives. Another group of villains gets assembled at the end of the issue. All major players, from a variety of different books, and people not really seen since Flashpoint. I’m not sure where all the cards will land, but even from this starting point it is clear that this miniseries will be intimately connected to Rebirth as it plays out.